You can phone us on 01 4526039 between 9 am and 6 PM Monday to Friday and 10AM to 2PM on Saturday for advice and information on our products and services. You can also find the answers to most frequently asked questions below. You can also Email us anytime by clicking here. Most of the most commonly asked questions are answered here but we are of course happy to answer any queries you have via phone or email and suggest solutions to your needs. What is free Satellite TV and Saorview ? Free to air satellite TV also known as Freesat and Saorview is a way to view over 130 of the most watched TV channels from Irelandand the UK for 0 per month, you simply pay a one off fee for a set top box and installation if you need this. Saorview is the name for RTE's new digital service and we can supply a system that allows you to watch both Saorview and UK free channels on one box with one remote. Some new channels are available and some existing channels have been changed by the broadcaster , how do I tune them in ? From time to time broadcasters change their transmission parameters so occasionally you need to update your receiver by doing a transponder (TP) scan. Further instructions down the page. On the Ariva combo receivers you can add any new transponders by pressing Menu, then move left or right using the arrows beside the OK button until you select "TP list" then press OK.
Press the green button to "Add" and enter the frequency, symbol rate, and polarity as per the details for the channel you want above. For example Movies for men has a frequency of 11344 with polarity H and symbol rate of 27500. You may see a message saying "TP already exists" in which case you can just select yes to go to the existing transponder. Press the blue button to search. A new menu should appear, set FTA only to "Yes" to avoid tuning in pay TV channels. Leave network search at no. Press ok and you should see the channels appearing and then "Search End". Press ok and these channels should now appear at the end of you channel list or alphabetically if you have your channel list set that way. You can then use the edit function by selecting Tv Channel list under "Edit Channel" in the menu to delete the original channel and replace it with the new channel you have just tuned in. On the Revez Q11 and Q12 please press the menu button on the remote select installation then satellite and then antenna settings . Change the satellite at the top of the page to Astra 2 and just below change the transponder to your chosen frequency. Change scan mode to FTA only and just below that change "Start search " to transponder . Press OK , a message appears " Network Search No" , press ok without changing this . When search finishes just press OK to save channels . The channels will now appear at the end of your channel list (just scroll below number one) . If you wish you can edit them into any position you choose. What areas can you install Freesat and Saorview in? 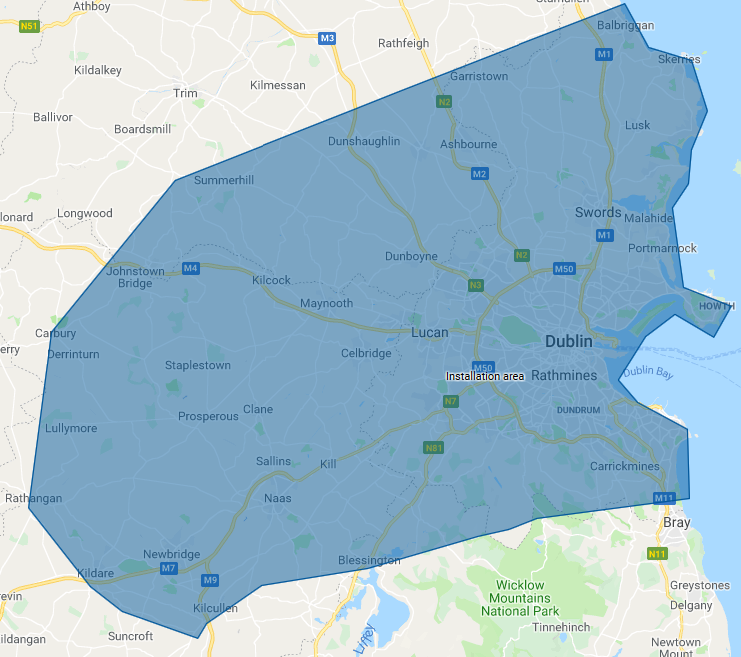 We can install the Freesat/Saorview channels system in Dublin and some surrounding areas, please see map below which you can click on for a closer look. Free next business day delivery in Ireland on all items. Free next business day delivery is available unless otherwise stated on the product page (a few larger items take two days) . You will receive a one hour delivery slot via text message so you do not have to wait in unneccessarily. DPD will advise by text message to your phone when to expect delivery within a one hour delivery slot so you do not have to wait in all day. We can also deliver to your workplace. What hard drives can be used with the Ferguson Ariva Combo box. If I have a Sky set up, i.e.. dish & LNB installed, can I buy a Free to air box and get the Free to air channels (ITV, BBC etc) from the Sky (astra 2) satellite? Yes you can simply replace your sky box with a Free To air box . Can I block out channels? We pre load boxes with a family friendly channel list and you can also delete any channel you do not wish to view and prevent it from being restored by using the parental control with a pin number you can set yourself. We have TV also in Bedroom will that need an extra box? To watch Saorview and Freesat channels on a second TV you need a second box with its own cable. I have a Freesat box from you and it asks me for a postcode, what do I enter? The Freesat system is UK based and it has regional variations so uses the postcode system to determine what region appears. Obviously in Ireland we do not have UK postcodes so you decide what region you wish to watch and enter the appropriate post code. Do Free to Air receivers have EPG's on them i.e.. can you receive something similar to Sky Guide with basic listings for Free to Air channels? Free to air receivers have a now and next program guide and combo boxes will give a 7 day guide on Saorview channels. What is meant by standard installation? Standard installation includes 20 m of cable and this allows for most installations carried out by us. However, should additional bracketry, cabling, or labour for example be required, this may incur an additional fee which will be discussed with you before work commences. I would like to get a satellite dish to see Italian channels as well as the Sky package (English) channels. Does this mean that I need to have two satellite dishes. An 80 cm dish with a multi LNB bracket can accomplish this. How many sets can I run off one satellite box? With the arrival of High definition and the reduction in the price of set top boxes most manufacturers no longer include an RF cable output with their boxes. Most people now choose a separate box for each TV which means that you can record and watch different channels which gives much greater viewing flexibility. Do I need a digital TV and video? Digital satellite equipment will work with your current TV and video equipment giving improved quality picture and sound as long as they have a Scart's socket which most TV's will have made in the last 10 years. Where is the dish placed on my house? The dish points in a southerly direction so if you can see where the sun is between 11 am and noon then that is the direction you are pointing. If this is at the front of your house do not despair, we can usually supply extra brackets to mount the dish at the back of your house (extra charges apply to this). We recommend you do not use chimney mounting as this may expose the dish to adverse weather conditions however if you still wish to use a chimney mounting we will install this for you. Will I have to tune in all of the channels myself? Our installer will do this for you as part of the installation and show you how the box works. If you buy a box without installation from us we will pre load the UK satellite channels and it takes just a few minutes to load the Saorview channels from your local transmitter . If you are served by the Three Rock or Kippure transmitter we can pre load the saorview channels also. Can you tell me what size dish I need? You can use the Sky Digital Mini dish anywhere in Ireland for reception of Astra 2 ( BBC, ITV etc.) For Astra 1 and Hot Bird an 80 cm dish is recommended. I am connected to cable TV, is it possible to receive basic cable on the same television I have the Sky satellite? Sure, satellite and saorview reception will not affect any existing services you already have. Is it possible to run two or more boxes from one dish?